A brief movie depicting perforated metal from Hendrick. You need Flash Player to see it. STAINLESS STEEL, MILD STEEL, ALUMINUM AND BRASS ETC. 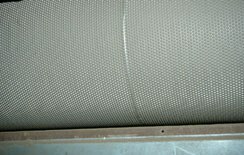 Mesh size varies from 1/4”-1/64”, Gauge 16-28 thickness. Beside Filtration & Separation of liquids, solids & gases, perforated sheets can provide the Perfect Solution to Multi-faceted design problems of Product Designers or Architects. Robust construction of our products ensures long lasting performance with no maintenance. Precisely designed, our products are in huge demand in the global market for excellent performance. We offer products at very affordable prices, suiting the budget of all. As, we know the value of time, we deliver products within the specified period. Our products are manufactured from the superior quality raw materials to add durability. Adhering to strict quality norms, our products are designed as per the national and international quality standards. We are the manufacturers of grain indented separation screens for Millers and machine fabricators who manufacture own cylinder segments. This makes us independent of suppliers and enables us to fulfill special customer requirements. We have minimized the distance between the individual pockets in order to achieve the highest possible number of grading pockets per cm2. We can therefore provide a higher sorting output and better separation quality than our competitors. The staggered arrangement of our pockets increases the service life of the segments. The indent cylinder is used for grading by length all granular materials such as wheat, oats, fine seeds, lentils, for separating stalks from sunflower and beet seeds and for separating unwanted long or short product impurities. The size of grains can vary between 2.0 mm and 8.0 mm. The product passes from the inlet housing into the interior of the rotating cylinder, the cover of which is provided with impressed pockets or so-called indents. 1. Flour mills to separate impurities such as buck wheat seed, grass seed, carpolite and oat from wheat. 2. Breweries and oat plants separate broken tablets and small particle impurities from Barley. 3. Seed corporations separate big and small material from seed. 4. Rice Mills to separate broken and head rice and precise grading of the same. 5. Separate impurities from all kind of minor cereals (such as lentils, peas, sunflower, plastic granules).